Contributors. Abbreviations. Preface. Foreword. Hypertension is a complex trait amenable to genetic analysis: basic strategies and integrative approaches, N.J. Schork, S.L. Kashkoush, and X. Xu. Improved strategies for the mapping of quantitative trait loci in the rat model, M. Stoll and H.J. Jacob. Genetic and congenic mapping of loci for blood pressure and blood pressure-related phenotypes in the rat, M. Knoblauch, B. Struk, S. Rubattu, and K. Lindpaintner. Molecular genetics of steroid biosynthesis in Dahl salt-sensitive and salt-resistant rats: linkage to the control of blood pressure, T.W. Kurtz, M. Pravenec, E. St. Lezin, and S.H. Mellon. Transgenic rats and hypertension, C. Payne, L. J. Mullins, D. Ogg, and J.J. Mullins. Mutating genes to study hypertension, J.H. Krege. Monogenic forms of mineralocorticoid hypertension, P.C. White. The amiloride-sensitive epithelial Na+ channel: structure and function of a key molecule for salt homeostasis, P. Barbry. The study of candidate genes in hypertension using tools of molecular biology and genetic epidemiology, F. Soubrier, A. Bonnardeaux, T. Nabika, X. Jeunemaitre, P. Corvol, and F. Cambien. 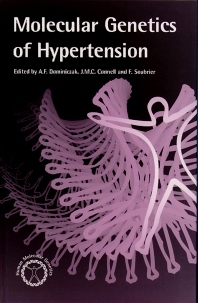 Angiotensinogen and hypertension, X. Jeunemaitre, A.-P. Gimenez-Roqueplo, J. Celerier, F. Soubrier, and P. Corvol. Pharmacogenomics in arterial hypertension, P. Ferrari and G. Bianchi. Molecular genetics of hypertension: future directions and impact on clinical management, F.C. Luft. Index. This is a rapidly expanding research area, with most current publications existing as journal articles, or as single chapters in larger volumes. This will be one of the first books to bring all this information together into a comprehensive review volume, aimed at both researchers and clinicians. Hypertension is a condition in humans which is characterized by persistently high arterial blood pressure (over 140/90 mm Hg). Affected individuals are at risk from heart disease, stroke and kidney failure. This important disease affects a huge number of people worldwide, and therefore the study of the disease is of vital clinical importance. Hypertension is a genetically determined disease, with many other contributing factors. Research has expanded rapidly in this area, particularly over the last decade, and there are continuing advances in our understanding of the disease. Postgraduates, researcher, and clinicians involved in the study of cardiovascular disease, cardiology and hypertension. Medical geneticists, molecular biologists, and pharmacology researchers. Gardiner Institute, Western Infirmary, Glasgow, U.K.